As I mentioned yesterday, I planked some salmon tonight for dinner. I used the Asian Barbecue Glaze and it was incredible, if I do say so myself. In fact, it was so good that I've decided to go with the title you see above rather than the "Asian Barbecued Salmon" title that I had originally planned. The old title somehow seems more than a little lacking now. 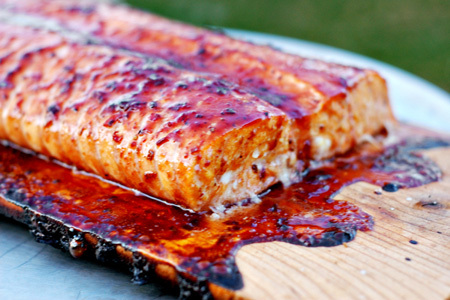 Of course cedar planks and salmon are made for each other; that's certainly no secret. However, the addition of the glaze takes things to a much higher level. The subtly smokey fish combined with the cherry and hoisin work wonderfully together. Soak the cedar planks in warm water for about two hours. Make sure they stay submerged. Cut the salmon filet in half width-wise. Season both sides of each half lightly with salt and pepper and brush with a light coat of oil. Place each half of the filet on a cedar plank with the skin-side down. Note: If the filet has a thin tapered belly edge, fold it under as you see in the picture below (bottom edge of the lower filet). Put the planks directly over the coals/flame and close the lid. Cook until you start to see a milky white edge form near the thick end of the filets (about 20 minutes at 375º). Brush the top of each filet with a liberal coating of the glaze. Continue cooking for another five minutes. Brush the top of each filet with another liberal coating of the glaze. Remove the planks to a sheet pan. Portion the filets and drizzle each with a little of the glaze. I made the glaze last night and put it on some chicken. The only thing I didn't have was the mirin, but it turned out amazing! I have some salmon and am definitely using this tonight for dinner! These pictures make my mouth water...thanks! I cannot wait to try this one. 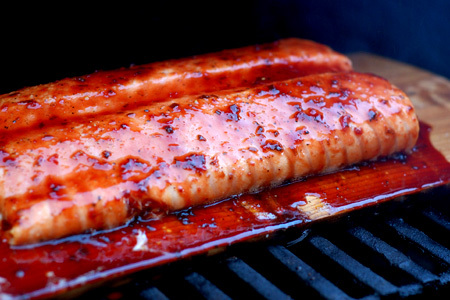 That is a gorgeous plank of salmon. Great tip about tucking the thin edge. I will definitely be making this for my wife and oldest son. This looks amazing! 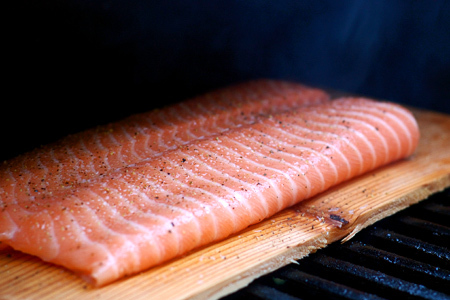 Salmon is our favorite, I've been wanting to try some of those cedar planks on the grill. I think we'll try this on Friday! Just curious, what size planks do you buy? I want to buy some, but there's a several sizes, just trying to decide what is the most useful....we eat salmon on the grill once a week, I'm thinking of buying in bulk on line. I am developing an asian glaze for ribs this week - I saw a few recipes with cherries in them. I am not a huge cherry fan so I'm wondering how strong the cherry flavor is? The picture looks absolutely drool-a-ble! Never thought to try it on salmon! Y'know, I don't even like salmon, and this looks absolutely delicious. I might make it for my husband soon. Thanks! I'll confess to never being all that crazy about salmon either, but I couldn't believe how good cookin' with the plank was. It completely changes the taste for the better! Yowza! This looks amazing. I'm definitely going to do this when I go camping! trying it tonight! had to search all over the place for mirin!! 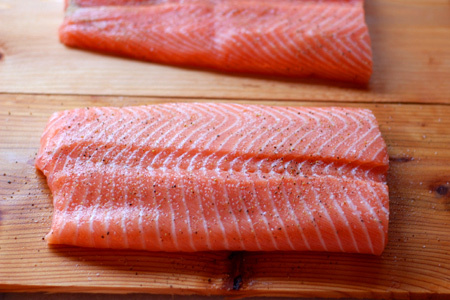 Sam - You can certainly bake the salmon on a plank, as mentioned here.